The roots of the construction of this lamp date back to 1895, when the concept for a tipless lamp was invented by Samuel Cox. He was manager of the Swan Lamp Manufacturing Company, a division of the Brush Electric Company of Cleveland, Ohio. That operation was transferred in 1895 to the Adams-Bagnall Company, with whom Cox remained. 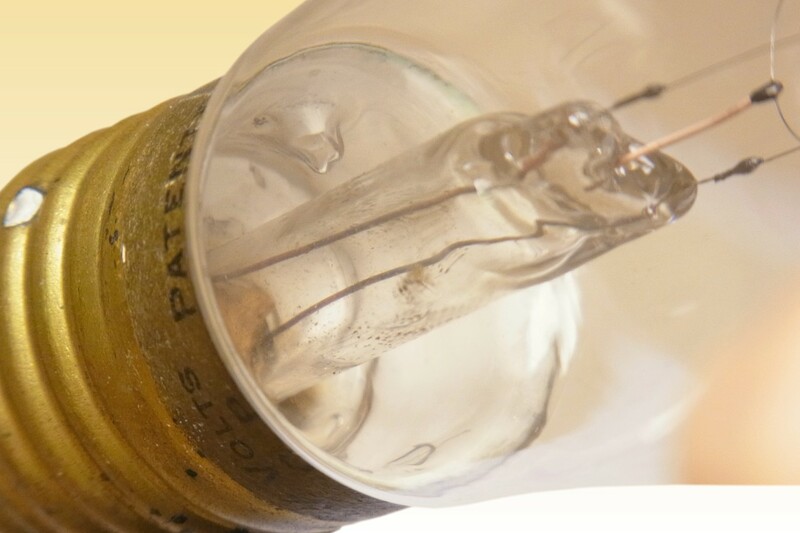 His first tipless lamp was awarded US Patent 548,036, but had a rather complex construction involving detailed manual glassblowing operations to seal the metal wires through the sidewall of the bulb neck, inside the cap area, and to accommodate an exhaust tube that was also concealed by the cap. In terms of manufacturing complexity it was not unlike the earlier Swan lamps made at the same location. 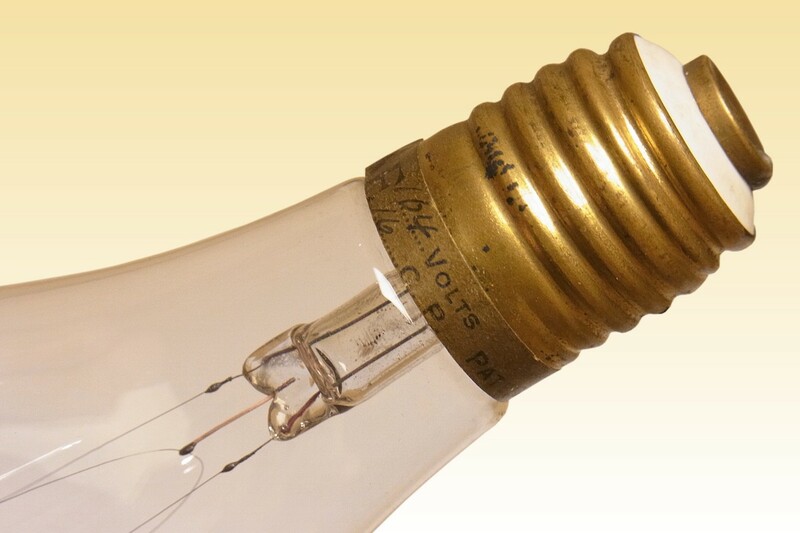 After 1893 most manufacturers adopted the Flared Stem construction, which greatly simplified the process of sealing the filament mount assembly into the bulb and reduced the tendency of the seal to crack. 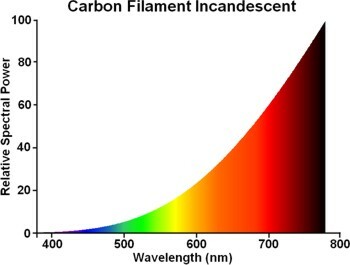 It is unusual that Cox did not adopt this improved design in his 1895 tipless lamp. However the lamp on this page, its direct successor, shows that by 1897 the design had been upgraded. It can be dated to this period owing to the brand name of Ft. Wayne marked on a brass-colour label attached to the cap - that company having taken over the Adams-Bagnall lamp operations in 1897 and itself being superseded in 1989 by the General Incandescent Lamp Company. Before sealing the flared stem into the bulb, a small nick would have been made in at the rim of the flare, leaving an open hole after sealing into the bulb. An exhaust tube was then fused to this hole, leaving the resulting tip concealed entirely within the cap. References: 1) Incandescent Lampmakers in Cleveland 1884-1905, Early Incandescent Lamps website, E.J. Covington. 2) History of the Adams-Bagnall Electric Company, The Incandescent Electric Lamp 1880-1925, E.J. Covington, NELA Press, 1998 p.10. 3) History of the Fort Wayne Electric Light Company, The Incandescent Electric Lamp 1880-1925, E.J. Covington, NELA Press, 1998 pp.10-15. 4) History of the Fort Wayne Lamp Company, The Incandescent Electric Lamp 1880-1925, E.J. Covington, NELA Press, 1998 pp.15. 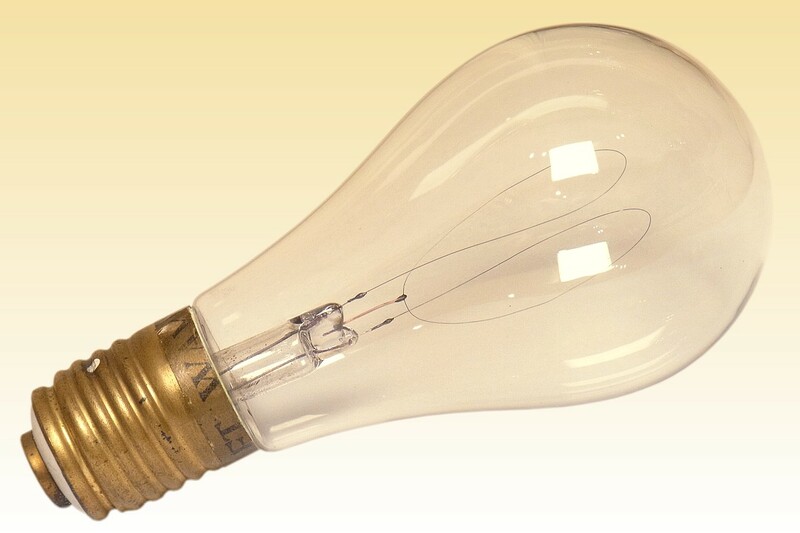 5) Cleveland-Based Lamp Manufacturers, The Incandescent Electric Lamp 1880-1925, E.J. Covington, NELA Press, 1998 pp.15. 6) The Brush Electric Company, by Jeffrey LaFavre.